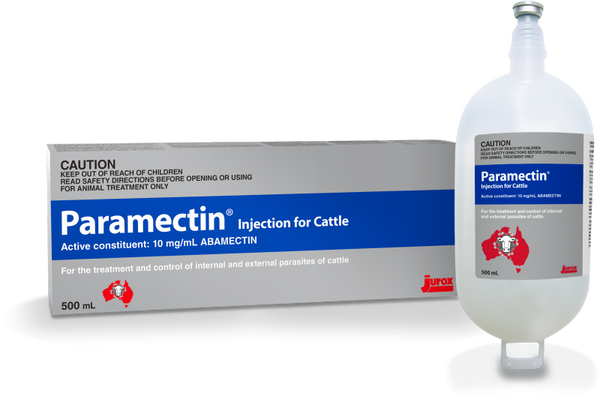 Paramectin® Injection contains abamectin, a member of the avermectin family of compounds which have a unique mode of action unrelated to that of other products used to control parasites of cattle in Australia. It provides a broad spectrum of efficacy against the species of internal and external parasites listed in the indications. Controls infection with Haemonchus placei, Ostertagia spp., Cooperia spp. and Oesophagostomum radiatum acquired up to 7 days after treatment. Dictyocaulus viviparus- adult and immature. Controls infection with Dictyocaulus viviparus acquired up to 14 days after treatment. Does not provide full control of the cattle biting louse Damalinia bovis. When used as directed for control of the internal parasites of cattle, Paramectin Injection concurrently aids in control of cattle tick (Boophilus microplus). Meat: DO NOT USE less than 30 days before slaughter for human consumption. Milk: DO NOT USE less than 30 days before the collection of milk for human consumption or processing. Subcutaneous injection only. Do not administer intravenously or intramuscularly. This product is contraindicated for use in calves under 16 weeks of age or less than 50 kg of bodyweight. Caution is advised in the treatment of severely stressed or debilitated animals.